There are three important periods in Joey Gonsiengfiao’s life as a director: his UE period when he shuttled between classroom and stage, trying to finish AB while presenting one big play on campus every semester; his Tower Periiod when he socialized in the show-biz circles and made abortive movie debut; and his Sine Pilipino Period when he learned from his past mistakes, helped form a trend-setting box-office movie director. UE Period – One remembers Joey as that diminutive, chinky-eyed fellow who would come panting to the Literary Criticism class at UE where he was a dropout and over-stayed for 10 years (1959-1969). Together with a big guy named Elwood Perez (now also a movie director), Joey would dominate the class discussions. The two were campus celebrities of sorts; Elwood wrote movie reviews for his column in Dawn, the college paper, while Joey directed stage plays (Becket, The Lark, My Fair Lady, Gigi, and The Glass Menagerie, which starred his signature actor Nestor Torre). Joey was forever rehearsing and his classes were such a hassle that he would drop all of his subjects every semester. He was a scholar. “The nearest visionary world to movies for me was the stage,” Joey says. “As a kid, I wanted to act in plays. Kapag hindi ako kasali sa bilada, aba, kinakausap ko ang titser.” At UE, Joey attended workshops and seminars and studied under Rolando Tinio, his mentor. Foundationd Day celebrations were never complete without a Joey Gosiengfiao play. What he learned on campus came in handy when he was assigned by Cecile Guidote to the Balentataw drama series on the defunct Channel 5, the TV arm of PETA. 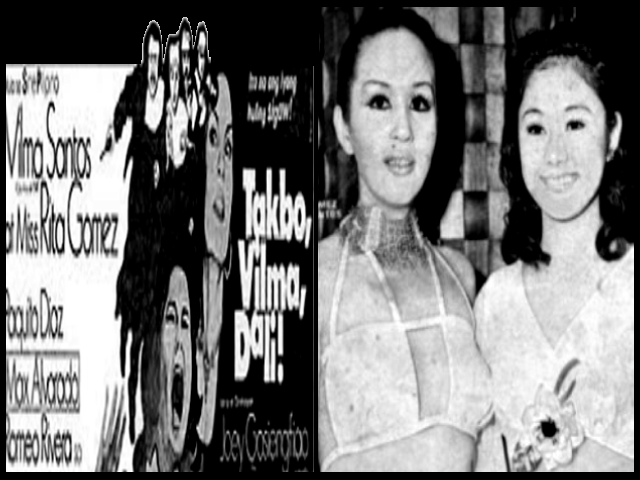 Sine Pilipino Period – Joey re-emerged in the movie scene in 1972, bristling with fresh ideas. This time he made a big gamble by helping his brother Victor and some friends put up Sine Pilipino, the company that would revolutionize trends in local movie-making. SP specializes in campy, stylish movies with imperative, three-word titles: Takbo, Vilma, Dali; Hatinggabi na, Vilma; Zoom, Zoom Superman!l; Si Popeye Atbp. ; and Sunugin Ang Samar. Except for the last mentioned which was an action saga, the four SP flicks were spoofs characterized by madness. They revived the all-star casting system, lumping together in one movie several big stars. The flicks made money. Joey Gosiengfiao had his “sweet revenge.” “It was not wasy for us in the beginning,” Joey relates. “Just before the showing of our first film, Takbo, Vilma Dali!, Martial Law was declared. There were no newspapers then so we had to post bills all over the city, hanggang Pasay nagdidikit kami nina Douglas. We also distributed hand bills. Sa awa ng Diyos, kumita ang pelikula.” Of the films he has done, Joey considers Sunugin Ang Samar as the most difficult, not only because of its scope but also because action is not his forte. It took him three months to make the movie because the script (by Wilfrido Nolledo) called for different settings and they had to move from one place to another. Joey didn’t exactly follow Nolledo’s script but he saw to it that “the spirit was retained.” Of late, Joey has organized his own company called Juan de la Cruz Productions together with Elwood and Douglas. Their inital production, Asawa Mo, Asawa KO, was a moneymaker. SP specializes in home-movie types while JC makes more of the woman’s movie, “that’s because we are not good for action pictures.” Joey is now connected with SP only as a director.